USS Xenia (AKA-51), was an Artemis-class attack cargo ship named after the minor planet 625 Xenia, which was named after the Greek word for hospitality. She served as a commissioned ship for 9 months. 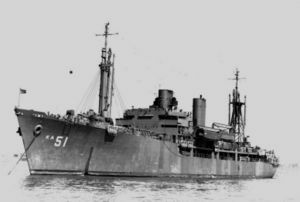 Xenia was laid down under Maritime Commission contract (MC hull 1912) on 4 May 1945 at Providence, R.I., by the Walsh-Kaiser Co., Inc.; launched on 27 June 1945; sponsored by Mrs. Roger W. Armstrong; and commissioned at the Boston Navy Yard on 28 July 1945, LCDR G. B. Service, USNR, in command. Shortly after the ship was commissioned, the town of Xenia, Ohio offered to adopt her. Following shakedown, Xenia operated off the east coast with Service Force, Atlantic Fleet, from September 1945 until 17 April 1946, when she reported to the Commandant, 3d Naval District, New York, N.Y., for disposal. Decommissioned on 13 May 1946, Xenia was struck from the Navy list on 30 November 1946 and subsequently transferred to the government of Chile. Renamed Presidente Errazuriz, she served the Chilean Navy, for a time serving as fleet flagship, until 1962. This page was last modified 18:46, 26 August 2010.